I love floating and watching all kinds of critters live their lives. One little fish will boldly chase off entire schools of much larger fish when they begin feeding in the little guy's territory. 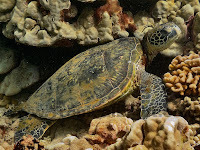 Most turtles contentedly drowse while tucked securely under rocks and coral, while Hawksbill turtles are always eating and chewing and eating some more. 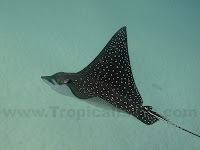 The Eagle rays hang nearly motionless facing into the current; sometimes alone, sometimes in groups.